As a lot of you will appreciate, to work good DX requires a low angle of radiation from the antenna. 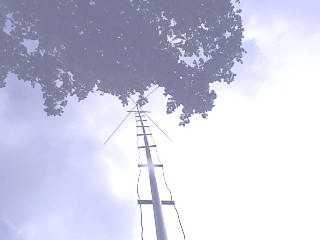 It is possible to achieve this low angle with a horizontal antenna, but only if sufficient height above ground can be achieved. Though this is possible on the higher bands, it is nigh on impossible at 40 metres and 80 metres (at least in the majority of UK sites). The vertical antenna looks to be the perfect low angle radiator, except for one thing... the height of a 1/4 l at 80 metres is 20 metres, or 66 feet, which is not practical to construct, erect or, more importantly, keep erected. I started this article with a bold statement, which needs some explanation for those of you who do not appreciate how a low angle of radiation can work better DX. So here is a simplified description of how radio signals radiate from an antenna. In figure 1, the signal transmitted from a horizontal antenna mounted at 1/4 l over a perfect earth is shown. In figure 2, this is represented with the same antenna at less than 1/4 l over the same perfect earth. A perfect earth is considered as a flat surface which is a perfect conductor and contains no resistive losses. In practice, this is impossible to obtain, but for the purpose of these illustrations it is adequate, and keeps the explanation clear and easy to comprehend. In figure 3, it can be seen that the vertical antenna shown, has a much lower angle of radiation. Now, I hear you ask, why is the angle so important. Well, it is all to do with the bounce of the signal off the atmosphere... let's look at the next three figures. In figure 4, the antenna in figure 1 is shown transmitting a signal from the antenna towards the atmosphere, where it will bounce off and head for the earth again. In reality this will happen many times before getting to the station at the far end, but for simplicity, I have shown only a few bounces. In figure 5, the angle of attack is greater, therefore the bounce distance is shorter, and thus no great DX is worked. With the vertical antenna, and its low angle of attack, the bounce is longer and the signal is stronger because the total path is shorter. Remember that the further the signal has to travel, the more of it gets lost on the way. My first thoughts on making a good DX antenna for the lower bands was centred around using a conventional short radiator with a lumped constant at the base or middle of the antenna. There are a number of problems with this approach and, over the years, I have tried most of them with varying degrees of success/failure. Most of the problems with home-made antennas are what I call the 3 'M's - materials, mechanical and man-power. Materials are usually the first stumbling block, and a good imagination along with some experimenting can provide excellent results. I use a lot of peculiar objects when experimenting with antennas, from plastic sandwich boxes to electric car antenna units. A look around your favourite DIY shop can produce a number of useful objects; check the plumbing department for any number of different plastic and metal fittings. From the hardware department, there are metal brackets, screws, bolts and fittings, and from the kitchenware department, there are a multitude of useful plastic boxes (most of which are waterproof). Another good source of tubing is an office furniture manufacturer, and it is often much cheaper than a traditional source. When it comes to designing a vertical with a loading coil the two major items for the shopping list are the metal tubing for the element and an appropriate former for the coil. In my experience, it is always the coil former which causes the most problems. The best solution I have ever found is to make my own using a piece of the tubing to be joined as a mould and filling this with epoxy resin. When the resin has set, I cut lengthways down the tubing to expose a perfect insulator. Maplin Electronics sell a 'potting compound' which works extremely well. However, if this is for a loading coil at the base of a tall vertical, then the diameter of the former has to be greatly oversized to provide enough strength. Mechanical problems probably top most peoples lists, when it comes to building antennas. This requires only a bit of experience, some basic testing and the willingness to re-design anything which doesn't work first time. Do not expect 'professional' results from your first antenna building efforts, or you will be sadly disappointed. Instead, try and get the antenna working first, test it and see that it can withstand the rigours of the weather - then improve the design and build version 2. Every experiment which works, should be detailed and perhaps used again in another design later. I remember seeing a dustbin on top of a friends car, at a radio rally. So, I inquired what it was for and how did it work, he showed me, in detail, all the notes he had taken on every stage of the development, up to the final version (I think it was version 5...). It was, of course, a mobile antenna for 160M, using the plastic dustbin as a former for the coil and an ingenious tuning mechanism using a plastic spatula with a piece of copper board stuck to it for the fine tuning. Ingenuity is the key to success. When designing a vertical antenna, two areas of the mechanical construction usually cause problems; the first is how to connect all the sections of tubing to be mechanically strong and electrically bonded and the second is the connections to the feedline and matching network. I think most people can make an electrical bond sufficient for an experimental antenna (I use electricians 'chocolate block'), but for a permanent installation, of the final version, then the type of materials used for screws, hardware and etc. must be considered as well as adequate weatherproofing. This is especially true when two (or more) dissimilar metals are joined together. This leaves the mechanical side of things to explore. Because not all the materials you might use in your antenna were designed for the special environment of home made antennas, you need to experiment and test new materials. Simple tests, like connecting a number pieces of tubing together and seeing how it stands up when there is a light breeze, a winter storm, or heavy rain. If you are designing a horizontal beam then experiment how long an element you can make before requiring a truss to support the ends and, if necessary, the best place for the truss-to-element connections. Other tests I perform are to leave a piece of an insulator material I want to test, out in the sun for a summer and see what happens to it. UV (Ultra-Violet) energy from the sun, acid rain, and temperature fluctuation, breaks down a lot of materials, including some which were designed for outdoor use! Of course, and insulator must also insulate and I subject my samples to about 30 seconds in the microwave oven, to check for heating. If the sample is cold when it comes out, then it is a good sign that it is an insulator to RF. I always put a glass of water in the microwave beside the sample, in case it is a perfect insulator, otherwise damage to the microwave oven can occur. My final 'M' is for man-power. Usually, though not always, home-made antennas are heavier and more cumbersome than commercial antennas. This is usually because they are built from available materials rather than custom made components. For reasons of safety, and ease of installation, get help when erecting, adjusting or dismantling an experimental antenna (This, of course, is also valid for any antenna work - but more so for home-made ones). I get help from my next door neighbour, who is not an amateur and doesn't make wise-cracks about my latest inventions, but a friendly (is there any other type?) amateur is better than trying to do it yourself. Remember, if the antenna falls off the roof, you end up with a pile of junk metal, but if you fall off the roof you end up in hospital. Safety first, at all times is the key to successful installations. Even if you are lucky enough to have a pump-up or tilt-over tower, watch out for electric power lines and telephone cables, etc. OK, so let's get back to my linear loaded vertical for 40 and 80 metres. As I stated earlier in this article, the normal convention for designing a short vertical is to use a loading coil (or lumped constant) at the base or in the middle of the antenna radiator. However, for this antenna, I wanted to experiment with an easier mechanical method and therefore more reliability in the long run. The linear loading method is used on a number of commercial beam antennas, but, as far as I know, only Gap use linear loading on their verticals. I have never seen a home brew linear loaded vertical design published. This is another reason to attempt to design and build one. The limitations I had were the available sizes of aluminium tubing which would stand up without requiring guy ropes or other aids to keep it upright. This proved to be approximately eight metres, using a support post of one metre with half of it above the ground and half of it below the ground. The radiator must be insulated from the support mast and I did this using a 300mm length of plastic water pipe, cut along one side and slipped over the bottom section of the radiator, before bolting it to the support mast with 2 jubilee clips. The 32mm plastic water pipe I used was the closest commercial size available and was heated slightly over a gas cooker ring to make it pliable enough to slip comfortably around the bottom section of the antenna. This was held in place until it cooled off with some electrical tape and 2 jubilee clips. What is Linear Loading and How Does it Work? Linear loading is a radio term for folding a portion of the antenna back against itself, in order to reduce the overall length of a quarter wave antenna to a more manageable size. In all the examples I explored, using this technique, the overall length can be reduced to up to 40% of the original quarter wavelength size without the losses resulting from using a loading coil. From a mechanical point of view, the antenna can be made from either a single length of lightweight tubing or from a number of length of telescoping tubing, and it can be self standing. There is no weak point from the insertion of a loading coil into the radiating element and there are no losses from the resistance of a coil. There is also no need for an insulator in the element or a coil former. The weatherproofing of the radiator is much easier and the time to build, set up, and test the antenna is reduced considerably. Mechanically, it makes for a strong stable antenna. So, how does it work? Well, this is an interesting area of discussion. Electrically, the antenna looks and acts like a vertical 1/4l radiator but with a different (higher) impedance at the feedpoint. On reception, it works almost as well as a full size radiator over the same groundplane. On transmit it seems to perform equally well, with the same reports being received with either antenna (I also made a 1/4l full size vertical for 40 metres for comparison). The feedpoint impedance is altered by the loading effect of the folded section of the antenna and the top hat assembly, and this requires careful consideration when it comes to resonating the antenna and matching it to the transmitter. Physically, the antenna just looks shorter than it should really be. For my design I chose a radiator which was 73% of the size of a quarter wave on 40 M, or 7.736 metres. This made the radiator rather short on 80 M at only 37% of a quarter wave, but it was the best I could do with the materials and restrictions I had imposed on this design. 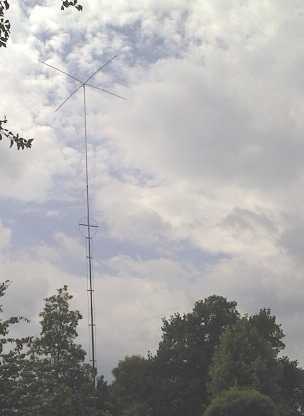 The final size was, as with all multi-band antennas, a compromise between the bands, the materials, and the location. This is one of the best things about designing your own antennas, you can tailor the design to fit the space and surroundings or materials to your own circumstances. Is a Good Groundplane Necessary? 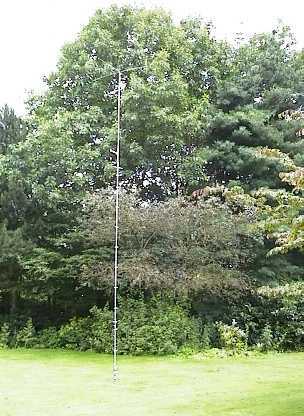 As with all vertical groundplane antennas, of course, a good groundplane is required. In the past I have experimented with lots of different groundplane configurations. There are numerous articles and books on the subject. In general, this is one case where the phrase 'less is more' does not work (especially for QRP). The idea of a good groundplane is to reflect the maximum of your radiated signal, and stop it being absorbed in the ground. It also reflects the received signal into your antenna and ultimately the radio. You can't work them, if you can't hear them. Ground radials of any length are better than none, but ideally ones just over a 1/4 wavelength are all that is necessary. Try linear loading the ground wires, this works quite well and is certainly better than no radials at all. Most gardens in the UK are not large enough for this type of installation, but, with some creative thoughts, great things can be achieved. Here is the story of my groundplane and its evolution. I live in a rented house on a modest estate in the southern part of the Netherlands, and my garden is quite large, which is great for experimenting. My landlord is quite used to seeing funny bits of metal sprouting from the ground on the weekends... But, I had a big problem to get a good earth mat, until one day we were in the garden and he was digging holes in the lawn. So, I enquired about what the holes were for... he said he hated the moles digging up the garden and was setting traps for them, just then a brilliant thought struck me. I suggested that he could bury a big bit of close meshed chicken wire all over the garden and then the moles would leave, because they could not get through the mesh...and would go elsewhere. Well, he bought the idea, hook, line and sinker, and the next weekend he hired a digger to lift all the turf and laid a complete covering of the ground in close-spaced chicken wire. I ensured that all the sections of the wire were 'properly' joined together and that copper ground rods were installed to hold the mesh in the ground. That was a year ago, and there are no mole hills in the part of the garden he covered, so his problem was solved, and, cunningly, I got a nice groundplane covering about 50 square metres. 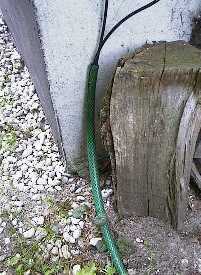 I also took the opportunity to bury some garden hose from the shack to the centre of the garden which I use to run my coax cables out to the centre of the garden. Oh joy...much better DX with my Cushcraft vertical - but everything has its downside, the radiation pattern from my 80M dipole at 6 metres high was so altered by the new groundplane that I could no longer work the UK reliably, all the signals were going skywards. I moved the dipole to the edge of the earth mat and raised it by 2 metres, and that made all the difference. Now, I appreciate, having lived in a flat near London for 8 years, that not every site can have an installation like mine. Do the best you can with the property you have. Having checked the 2:1 VSWR points without the top hat assembly, and obtaining a 180kHz 2:1 bandwidth on 80M, I added the top capacity hat to the antenna. This had an effect on the resonant frequency and the input impedance, of course, but increased the band coverage to almost the whole of the 80M band (3.500 to 3.800 MHz) and a resulting shortening of the wire elements (on 80M by almost 3 metres. length of tubing was squeezed in a vice to square off the sides and provide a secure mounting place for the strips. The strips, themselves, were simply placed in the vice at 50mm, heated slightly with a blow-torch and bent to a 90 degree angle. At a later date, in order to supply some extra strength to the top-hat assembly, a small (150mm) circular aluminium plate was placed over the top of the element to support the strips of the capacity hat. The strips were screwed tightly to the plate using self taping screws through the holes in the plate. This altered the tuning only slightly. On a visit to my local DIY shop, where they know me on first-name terms now, I purchased four two-metre lengths of aluminium tubing which would telescope together. This gave me a 30mm diameter tubing for the base section. Into that I slipped the next section which was 26mm and then the 22mm section into that and finally the 18mm section. I always find it easier to convert all the terms of my equations to the smallest common base, before doing the calculations, in this case I chose millimetres. At the bottom of the radiator, the plastic drain-pipe was used to insulate the radiator from the mounting bracket and the earthing system. It is extremely important that the radiator is isolated from the ground at this point. A screw was inserted into the bottom section of the tubing for connecting the wire portions of the radiating element. 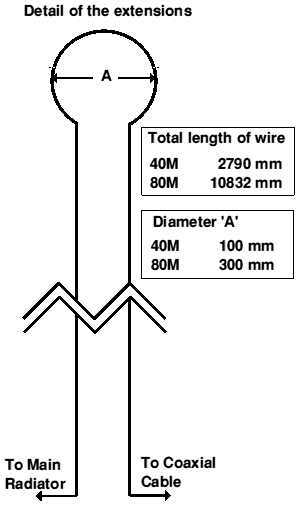 13097 X 0.8270 which equals 10832mm as the length of wire required. Each wire was measured out and bent in half to obtain the exact middle of each length. For 40M, a 100mm loop was formed at the centre by wrapping the wire around a conveniently sized tin from the kitchen and, in a similar manner a 300mm loop was formed in the 80M length. The wire is stiff enough to hold this shape with the stand off insulators, in all but the absolute worst of outdoor weather. I made the stand-off insulators from a piece of plastic strip which is used to edge MDF furniture. The strip was cut into lengths and screwed to the main radiator with a self-tapping screw. I cut 5 strips of 50mm, 14 strips of 120mm and one strip of 320mm, which used most of the 2.75-metre length of plastic strip.This type of strip has an edging on each side, and holes were drilled in these edges to accept the wires. Each wire was held in place on the insulator with hot-melt glue after the final testing and alignment was performed. The distance between the wires was 40mm apart for the 40M section and 100mm apart for the 80M section. The two wires and the insulators were then screwed to the centre radiator, one to each side, to reduce the coupling effects, using sheet metal screws. One side of each of the extensions was connected to the screw at the base of the radiating element and the free sides were left open to connect to the transmitter. Obviously, the antenna was a little long on both 40M and 80M. The wire was progressively shortened by 10mm and after a few trials this seems to have done the trick. The most efficient matching is with no matching network involved, so I did a lot of experimenting with different lengths of tubing and different lengths of wire to try and achieve a good match directly to the 50 Ohm coax for the 40M version of the antenna. Eventually, I hit on the 7.736 metre radiator and the rest of wire. This provided a good impedance match at 7050 kHz. It was slightly capacitive, but the VSWR match to 50 Ohm coaxial cable and to the transmitter, were good enough. For 80M, I scaled the 40M design and tried it (the wire length was 12.59 metres). When measured, the resonant frequency was too low, and the match was not too good, so I set about cutting the element, a little bit at a time, until a good match and resonance in the band were found. After getting the antenna matched to the transmitter I hot-melt glued all the wires to the plastic insulators and made permanent connections to the two feedlines inside a plastic weatherproof box, which was mounted on the bottom of the radiator element. Originally, I designed the antenna for 40M only, and added the 80M length afterwards, based on the success I had with the 40M version. Both antennas are mounted on the same telescopic radiator, and each is fed with a separate coaxial feeder. A switch or relay could be mounted at the base to allow a single feeder to the shack. I tried connecting both elements together and feeding them from one feeder, and 40M worked perfectly, however, 80M was unusable with this configuration, as the 40M length is effectively shorting out the 80M element. To make the antenna portable you could cut the element wires and re-joined them with electricians 'chocolate block' so that the antenna could be dismantled and transported in a easy way. After having tried this, I reassembled the entire antenna and the whole antenna was tested again. The tests showed that nothing much had changed. Knowing that not all amateurs can have a groundplane such as mine, I made four 20-metre radials and linear loaded them into a 10 metre square area, in an attempt to emulate a common UK 'postage stamp' garden. 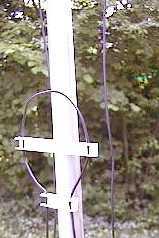 I then erected the antenna and attached it to this groundplane and checked the VSWR again. There was virtually no difference in the VSWR readings (1.5:1 instead of 1.2:1), however, the DX I could hear and work was slightly weaker than when the antenna was in the middle of my big groundplane. The materials required are shown in the table, with their respective lengths the total cost for the materials was under 50 UK Pounds. If there is enough interest, I could put together a kit of parts for the 40M, 80M or dual bander and distribute it through an UK dealer. One great thing about this antenna is that no special tools or skills are required to construct it, you do not need to cut any of the tubing, make any fancy brackets, buy any special parts or construct a complicated matching network. A small drill, a tape measure, a screwdriver, some glue or a hot-melt glue gun and a pair of side cutters are all the tools required. I have applied for a patent, registration and hold the copyright on the design of this antenna, anyone wishing to build this antenna on a commercial basis, or for sale, in any country in the world must contact the Author and make the appropriate payments and recognition. For individuals who wish to make this antenna for their own use, then permission is granted by the Author, however commercial gain, whether monetary or in goods/services, made from the sale of this design will be subject to the full extent of the law governing the jurisdiction. Patent Pending 1998 D.A.Reid. I found the antenna easy and fun to build. Comparing it with my Cushcraft AP8A vertical, the antenna performs much better for DX on both 80M and 40M. I built a full size 1/4 wave vertical for 40M for comparison and the DX was the same with both antenna on 40M. I would like to thank the DX stations whom put up with me asking them to compare the two antenna and to those stations on this side for their co-operation and understanding (well most of them, anyway). David Reid, 35, was first licensed in 1981 as GM6JLQ in the Borders Region of Scotland. He joined the RSGB in 1980 after spending many hours in the shack of GM4CXP, Derrick. David was also the first UK Class 'B' radio amateur to be awarded a CW certificate (by the GQRP club - working under a variance on his class 'B' callsign). In 1985, he passed his CW exam and became GM0BZF. Since then, he has held numerous callsigns including GJ0BZF, G0BZF and now holds PA3HBB as well as keeping G0BZF. His interest in antennas began with the citizen band radio era in the late 1970's and early 1980's. He has been active in the design of antennas right from the beginning of his amateur hobby. He has had a number of articles published in various magazines (including Radio Communication). Many people will testify to the strong VHF signals emanating from YP07 square and XP07 from is home made antennas in the early 80's. His craziest antenna was a 2-metre dish made from scrap strips of PCB material. The dish was strapped to the back of a kitchen chair and fed by a dipole. With only 10 watts of power he was getting 59+ reports from as far as Newcastle and Hull, from his QTH in the tweed valley. He has been involved with many contests and contest groups throughout the years and is always trying to improve his antenna systems. He operates mobile as well and even constructed a monster 160M mobile antenna from copper plumbing pipe and litz wire. Professionally, he has a background in electronics and computer hardware, but these day is making a living in Europe as a technical author/editor.